In gneisses the mafic minerals (biotite and amphibole) and light minerals (quartz and feldspar) have separated into separate bands. Banded foliation composed of layers/zones of light colored quartz, feldspar interlayered with layers/zones of dark colored biotite and amphibole. The minerals bands in this specimen are just beginning to develop, but are distinctly separate from each other putting it in the gneissic category. 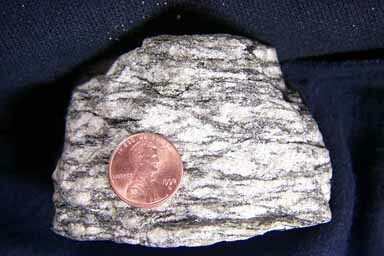 This specimen is not far removed from a schist seen closeup (for example), but the megascopic banding here puts it in the gneiss category. At the other end of the spectrum the banding is very distinct. Gneisses are typically associated with major mountain building events when shales or clay rich sandstones (wackes), or felsic igneous rocks (e.g. granite, granodiorite, etc.) are metamorphosed through depth of burial, and proximity to batholiths (click picture for larger version). Slates are part of a metamorphic sequence that begins with shale and progresses through slate, phyllite, schist, and gneiss. At the top of this column you can click through rocks showing the changes. Or go to Barrovian metamorphic changes.